A new year is just around the corner, and with it will be many resolutions to be made. Most resolutions consist of getting rid of bad habits and bettering oneself. Things that are usually easier said than done. With a little help from an app, this year’s resolutions could be your most successful yet. 21&Different is the ultimate companion in guiding you towards positive, personal transformation! Improve your life and develop valuable skills as you achieve good habit formation through small, daily tasks. Ensure positive, healthy habits and maintain whole life wellness! Take the challenge today! View and share your progress in the challenge daily! Utilize the Journal to record your thoughts along the journey! Challenge and encourage others to improve their lives with 21&Different by sharing your progress via social media! 21 & Different doesn’t just focus on changing one task or aspect to change, but several specific categories with tasks that can be assigned to them. The app then suggests creating three tasks to each category, but keeping them simple and attainable. Registering is suggested but not required, which is nice if you are looking to test things out before deciding to completely commit to the app. Setting up the tasks was very easy. Click on a category, such as Physical, then Add New Task. There are even some suggestions tasks to choose from like Take a Multi-Vitamin or Eat a Piece of Fruit, common things that could fit your goals but also guidelines for how simple they want your tasks to be. Label your task and add a time for your reminder, along with a description of your task. Hit save and you are good to go. Do this with each category to finish your challenge. 21 & Different isn’t just a task manager either. Along with keeping up with your tasks and progress, there are motivational quotes and videos for the areas you are focusing on as well as a journal to keep notes on your progress. Some of these features will require an upgrade to the premium version however. 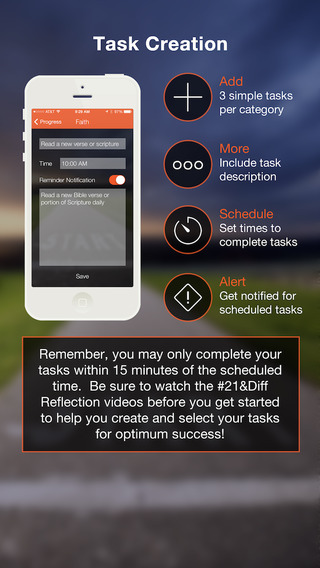 Overall, 21 & Different is an original app with great intentions. It is simple to navigate and I love all of the supportive feedback there is within the app in word and video form. There is a genuine feel that it is about wanting change and succeeding doing it. The app is currently free in the App Store and compatible with iPhone, iPad, and iPod Touch.